appear real. Even professional statisticians have been known to foul that up when they believe that they’ve found something interesting. two numbers, and that his third isn’t really disinct. it’s fair to consider S to be an independent constant: it’s derived from Π, so I’d claim that anything in S is really just deeply hidden in Π. This argument is really pretty shallow, even as this sort of silliness goes. been placed there by deliberate actions of a deity. Throughout the many centuries pi (π) has been thought to be a random number. With the advent of computers which excel in mathematical analysis this concept has been reinforced. much less random can you really get? 1) Pi (pi = 3.141592653…) starts with 3_4_5 which is the smallest Pythagorean Triplet possible forming the Pythagorean triangle. This triplet, 3_4_5 can be recognized as the representation of the Pythagorean Theorem. Also in pi the sequence 1_ _2_ _3. In √2 early the sequence1_2_3 and 4_ _3_ _2. the square root of two, and you skip pairs of digits, you can find 1, 2, 3 and 4, 3, 2.
square root of 31, the 2nd through fourth digits are 567. In the square root of 311, using the pattern of take one, skip 2, the in the leading section, I find 1, 3, 9 – powers of the first digit of 311! Moving on to slightly more interesting patterns, another of his profound discoveries is, if you separate the leading digits into pairs, two of the first three pairs in Π are used in equations that are relatively good at generating small primes. Yep. Two of the first three base-10 digit pairs happen to be used in equations that are probabilistically good at finding small primes. Wow! I’m impressed, aren’t you? 6) Pi = 3.14159265358979323… It is very odd that a group of eight small different contiguous primes: 3, 14159, 2, 653, 5, 89, 7, 9323 are right at the start of pi. Many and possibly infinite small (numbers with five or fewer digits) and large (greater than five digits) different contiguous primes may exist after “9323”. It will be interesting to see how many digits the average contiguous prime has. Perhaps more interesting may be to find how scarce are groups consisting of eight small contiguous primes of which none of the prime numbers are duplicated. will contain a sequence of primes varying between 1 and 4 digits in the first 10. And Π isn’t one of them! To make that work, he needs a 5 digit prime. computation to show that it’s not an unlikely phenomena. 10) √2 starts with the Fibonacci sequence 1_1_2_3 in which 11, 23 and 1123 are primes. In √2 the Fibonacci sequence is included: 1, 1, 2, 3, 5, 8(6+2), 13(3+7+3). Very odd that seven numbers of the Fibonacci sequence are found at the start of the square root of 2.
sized groups of digits together you can get first seven members of the fibonacci sequence. using base-ten digits, the first seven numbers in the fibonacci sequence are hidden as the first, third, fifth, seventh+eighth, and ninth+tenth+evelenth digits of the square root of two. And of course, the “pattern” stops there. Question: If you are clever enough you can find oddities in all numbers. What do you have to say about that? Vas: Perhaps I am not so clever. I have tried several random numbers and have only limited success in finding oddities. One could successfully write countless unique equations to fit every constant or random number and call it an oddity. It is difficult however to find oddities using only the basics such as prime numbers, Fibonacci sequence and the Pythagorean triplet. No equations or algorithms are used in Document A. What makes it even more odd and interesting is that pi, the square root of two and S have several interwoven oddities. There are also two interesting blocks, one at E-3 and the other at E-4 (see alphanumeric locators on the sides of Document A). If you are correct all numbers lets say from 000000001 to 999999999 should have oddities similar to pi. Why does 000000001 and 999999999 lack oddities which includes Fibonacci, geometric and prime numbers and the like which are easily found in the first nine digits of pi? You are welcome to try your luck at finding oddities in random numbers. See random number generator: http://www.randomnumbers.info (enter 10 and 9). Good luck. Let me know how you did. those numbers, I’m pretty sure I could come up with a list at least as compelling as his. I also find his claim that “no equations or algorithms are used” hysterically funny. Skipping every other digit is an algorithm. He explicitly talks about the role of the numbers 41 and 59 in equations that probabilistically generate likely primes. His entire argument consists of random eyeball patterns, trivial algorithms, and silly equations. One last thing, and then I’ll stop picking on this idiot. a fixed and unchangeable result of that axiomatic system. where we’d naturally devise Euclidean geometry; but he can’t have chosen the digits of Π in that system. the curvature of space, the strengths of the basic forces, Planck’s number, etc. Things that are conceivably variable between different universes, and that therefore say something about what your deity created. What do you get? Infinity! And God is infinite, isn’t he? CQFD. This guy Vas is thinking way too hard, it’s so simple in the end. Oh, I’ve just decided that this is the last time I capitalize god. Two more comments. I meant “QED” not “CQFD” in my previous post. “CQFD” is the French equivalent to the latin “QED”. this sort of numerological nonsense that many people forget. has nothing to do with its expression using the digits 3, 1 and 1. In general, there is a “pattern” whenever the number is not a Chaitin constant (e.g. the number is not Kolmogorov random). By a “pattern” we typically mean a descriptive process (e.g. a machine) for generating the number that is smaller than the number itself. (a + bn)/n = x therefore God exists. Funny thing about the messages in π idea, Carl Sagan used the same idea in apparent seriousness in his novel Contact. I have very little idea what he was trying to say with this. A lot of run-of-the-mill science fiction has neat-sounding but ultimately incoherent ideas thrown about, but I kind of expected Sagan to have thought through his stuff a bit more. What I find most amusing is that all the other, more interesting properties of pi (and e etc) arguably make a much better case for the existence of god, or at least some sort of mysterious cosmic elegance. And that’s coming from an atheist. I thought of mentioning Contact in this post, but decided not to – why sully Sagan by associating him with a moron? Frankly, Contact bugged me for the same reason that I griped at the end of the post. If God wants to leave a message in the universe, there are plenty of places he could put it. But not Π. That makes no sense – because it’s not a part of the universe, but rather a mathematical abstraction that has an inevitable value. If you want to find the hand of a creator in a number, look at a number whose value could vary dependending on the creators actions in creating the universe – not one that can’t be varied. God can’t make Π be 3. Π is what it is, and that can’t be changed. The moron who’s argument I mocked in the post is a moron, and I don’t really expect better from his ilk. But Sagan knew enough to know better than to make that kind of mistake. Theorem: All whole numbers are interesting. Proof. Suppose that there are some uninteresting numbers. By the fact that the whole numbers are well-ordered, there is a smallest uninteresting number n. But hey, that’s pretty interesting! Thus, n is interesting, a contradiction. At least this has some rigour behind it. Did you ever see the movie Pi? It involved some gematria. He should have taken the much more interesting coincidence that the iniitial part 2718281 of the decimal expansion of e is a prime number as basis for his proof that god exists. I believe that a god that can encode messaged in pi or any other mathematical constant such as e or whatever to be a much more powerful being than one who can encode messages in more physical constants e.g. the fine structure constant. The latter is akin to a grand universal architect, thus a being imaginable to a certain extent, while the former is almost totally unimaginable. There is no way I can attempt to imagine how to manipulate a mathematical constant, and thus by doing so, the being becomes unimaginatively powerful. To a certain extent I believe this was Sagan’s point in Contact. If you really want to jerk this clown around, have him rework all that in octal. God vanishes and he ends up with Gabbo. Hmmm, Π = 4/1 – 4/3 + 4/5 – 4/7 + 4/9 – 4/11 seems pretty rational to me 🙂 Did you drop “…” on the end there? Sounds like his “pattern” is highly dependent on the representation system chosen. How about hex or binary? Phhhht! Been reading some Douglas Hofstadter, have we? Let me preface this by saying that I think that this guy is full of crap too. However, your arguments against using base 10 because it is just a human convention and that pi is a natural value and thus not manipulable by God answer each other. Perhaps the fact that we chose base 10 was not an accident, but was rather a direct action of God which caused the patters to appear in pi. About Contact, when I first read that bit, my head exploded at the idea of a God who could and would do that, especially since Pi isn’t only derivable from properties of the Euclidean plane – it pops up in umpteen different contexts as well. When the coolness wore off, I then figured that, if you look through enough digits, in enough bases, the probability of some such pattern occurring approaches one. Since I figured that Sagan had probably managed to get past 8th-grade math, I then concluded that he knew this. Around that point, I developed a nasty headache and dizziness! After the pounding subsided, I felt he was saying something else, that loses its point unless you had worked through this train of logic, and felt quite satisfied with the ending. Note that the base 10 could have been decided by a deity, if such thing existed: we have been created with 10 fingers, so we using base 10 is not an accident. some food for thought: There is a good order on R [the real numbers] (except that we can’t define it explicitely). Does this mean we have the same theorem on R, i.e. there isn’t any uninteresting real number? There is an uninteresting real number. It maps to the day the condemned prisoner is unexpextedly hanged! Well, I see pretty much all of my comments have already been made. I recall one person getting all agog about some random confluence of the numbers 3,5 and 7 in some circumstance or other. I was astounded that an apparently intelligent person would think there was anything to it. Anyway, I went into Rainman mode and just rattled off a lengthy sequence of coincidences (and a few that were not coincidences at all, but looked like coincidences to the ignorant and credulous) involving 3,5 and 7 (and piles of other numbers) for, oh a good 3 minutes straight. Like so: “Hey, look, their sum evenly divides into their product! And lo, the division yields 7 again — a-stounding!” and so on and on, ad nauseam. Eventually, they begged me to stop. They never mentioned anything about mystic, meaningful numbers in my hearing again. I think I kinda spoiled the whole fantasy for them. results, too. His post was excellent. Off topic, I know… but I got to wonder: Why are you using upper-case pi ∏ instead of (as I believe is more traditional) lower-case pi π? Your comments at the end brought up an interesting thought: π as usually conceived is the euclidean space π. Since the geometry of spacetime is determined by the distribution of matter and energy in general relativity, the fact that π = 3.14159… is merely a reflection of the distribution of mass in the universe, and not a universal fact (a limiting case to be sure, but no more universal than the fact that there is an “up” and a “down”, true only because we are close to a large mass). Anyways, nice debunking of some good crankery. I disagree with your characterization that “Π isn’t random. No one who understands what “random” means would say that.” There is for example the idea of a number being “normal” that is all the digits have a uniform distribution. This idea is another encapsulation of the notion that a number is “random” in some sense. It is widely believed (although not proven) that Π is normal. And in fact computational work has helped reinforce this perception just as our crank says. We see this in other forms of religious fundamentalism as well. The fossils were put in the ground by Satan to test our faith. Light from other stars doesn’t imply the universe was billions of years old, the light was just put there in space by God so we would see it and *think* it was billions of years old! Fundamentalists, and scriptural literalists are concrete thinkers with below-average capacity for abstract thought. They force-fit everything to fit the literal language of scripture, even to the point of torturing empirical findings, logic, and common sense. When something doesn’t fit, they go into escalating paranoia mode, including ideas of reference. But let’s not conflate that with mysticism, which is the polar opposite of fundamentalism, and tends to occur with people who have an above-average capacity for abstraction. Mystics, when they run across interesting patterns in numbers, are more likely to simply appreciate them as an aesthetic matter, or recognize that the meaningfulness of patterns is a property of their own minds. Particularly in the Sufi tradition and to an extent in Buddhism, are teaching-stories whose point is to make humor of the tendency of people to externalize the deity rather than recognize their own imaginations at work. One can appreciate the beauty of something without having to own it, whether directly or via one’s deity. However this makes it LESS surprising to find structure in them. For example a randomly chosen real from an interval almost surely (that is with probability 1) contains every finite string of digits (is normal) in every base. If anything would show specialness of pi it would be if someone proved it was non-normal. The following question is probably a bit off-topic, but there is something that has been bothering me for a quite while about the “natural” base-ten thing, and you are probably the right community to discuss such matters. Perhaps you can share some thought with me. In base-ten we have ten different numerals to describe the value at a given position. For example in the number ’11’, the rightmost ‘1’ describes the value ten, and the leftmost ‘1’ describes the value one. But with our ten fingers we actually have eleven different “numerals” to describe values at given positions. Imagine a shepherd who uses his hands to count sheep. All goes well until his herd exceeds ten sheep. Until then, he was able to count the number of sheep with his hands, but now he needs the help of his son. As he counts sheep with his fingers, his son has to count how often his fingers “overflow”. They start counting. As the shepherd reaches the tenth sheep, all his fingers are spread, but none of the fingers of his son (That would be the number ’01’ base-eleven). If he continues counting to the eleventh sheep, he has to fold all his fingers, and the son has to spread his first finger. The eleventh sheep is such represented by the number ’10’ base-eleven. Shouldn’t we all be using the “natural” base-eleven system? There is a lot of discussion in the posts above about natural choices of base for human numbers. We all understand where the base 10 convention came from and I don’t know of any cultures where base 8 was used, so the discussion of no thumbs included is spurious (it seeks to explain something that never happened; the current use of octal is related to the characteristics of computing machines rather than to the characteristics of human beings). However base 60 does occur frequently in ancient cultures – in our culture it is seen in the 360° in the circle and in seconds:minutes:hours. So my question is why was base 60 the second most common choice for humans to represent numbers? I’ve studied some Jewish mysticism, and seen how gematria is used. I argue that, in general, it’s used more as an imaginative tool than anything else. What I mean by that is best explained by an example of how I actually really use it. Sometimes when I’m working on a problem, I hit a wall. I can’t figure out how to solve it – I’m stuck spinning my wheels. I can’t think of any way around the problem. Frequently, part of what’s going on there is that I’ve got a general solution or strategy in mind. But it’s the *wrong* solution, and I just keep spinning around variations trying to get that to work. What I do when I get into that mode is look for something that distracts me from my subconscious solution. I try to do some sort of free-association on random information. So I’ll do something goofy, like take the name I’m using for the problem, transliterate it into hebrew, turn the letters into numbers, and play with them. I’m not getting at any kind of deep truth hidden in the numbers. What I’m doing is working around my inflexibility by playing games with randomness. The real Jewish mysticism is, I think, much more like that. As a Jew, it’s really pretty annoying to see all the newagers claiming to do Kabbalah, when they don’t have a clue of what it really is or what it means. Sounds like the Bible Code in a different guise. In “War and Peace”, the hero Pierre becomes obsessed with numerology and “proves” that Napoleon is the Beast 666. I suppose these days there is a lot more of it about. why use Π not π? it means completely different things. I think a god that encodes its messages in totillas and pavement stains is way more impressive. As to capitalisation, I capitalise ‘god’ when I am using the word as a proper noun. I’m glad that you picked in the Sagan pie-eyed silliness. That was the most annoying thing about the book. The best part, to me, was the protagonist, as a girl, taking apart radios and putting them back together. Rang true. Turns out that Carl’s wife wrote that chapter. Say, suppose that a race of aliens discover that their average one has a number of tentacles equal to pi? The science fiction story “Black Physics” that I’ve been writing with my wife on and off since — yikes — the late 1980s, has travel through the multiverse, with each cosmos having a unique ID formed from its set of fundamental physical constants. Zap! The glowing beam – was it ionized air, she wondered – almost struck her in the face. She dived to the left, and as she tucked and rolled, she could see other men in glowing suits and pyramidal hats pointing their bizarre weapons towards her. She smelled the lightning-storm tang of ozone in the air, and the skunky reek of her own burnt hair. rhythm track, and there was a metallic taste on her dry tongue. Another of those floating robot zeppelins yawed in the air above her, aiming an array of sensors or weapons, or god knows what. spaces between their fingers rather than the fingers themselves. angle unit, with 360 units in a full circle. If he continues counting to the eleventh sheep, he has to fold all his fingers, and the son has to spread his first finger. The eleventh sheep is such represented by the number ’10’ base-eleven. That’s not an obvious way of counting. One obstacle is the “no fingers” position. The farmer starts his count at “one finger” for the first sheep, so he’d want to start the second cycle with “one finger” as well. The cycles would wind up being 1-10, 11-20, 21-30, and so on. But it would take a fair amount of mathematical sophistication to get the idea of using his son as an overflow counter. It’s more obvious to use the son’s fingers as a continuation … “one man’s hands and one finger”, “one man’s hands and two fingers”. So by the time decimal notation gets invented, there’s already a tradition of counting things in groups of 10. 4) Pi starts with the prime number 31 which is also a Mersenne Prime. The cube root of 31=3.141380652 which is within .00657% of pi. Within .00675%; wow, now that is cosmic. Wow. I’d be more impressed if the first thing the moron had done hadn’t been a mistake. Right at the top, the “mystical” correlation shown by the first two triangles. 3-4-5 is a pythagorean triple, I agree, but 1-1-2 isn’t. (3-4-5 works without any square roots, but 1-1-2 doesn’t — you’ve gotta have a radical.) This maroon changed his freaking formula from the first example to the second! I could come up with lots more examples of “mystic” numbers if I was sleazy enough to just flat out lie like that. I believe in God and even that seems out there to me. Pi is contained within pi. 314159265358 from the 1,142,905,318,634-th decimal digit. As with the Einstein-Podolsky-Rosen paradox the trick is not data but information. Pi doesn’t contain any information (one exception noted). Can God make a collection plate so vast that even He cannot fill it? Sure! ALL OF THEM. You might be interested to look at my article A Possible Proof of God’s Existence from Multiversity Assumptions. My argument is based on future mathematics, physics and biology (i.e. the argument won’t actually work until sometime in the future when we know enough mathematics, physics and biology to make it work). I have added a diagram at the bottom, which hopefully helps to explain it better. So all of his math, of course, presumes that God wants us to use Base-10 math, in spite of the human history to use dodecimal (base-12) or sexagecimal (base-60). Oy. Stupid makes my brain hurt. If anyone is interested, I have written a more detailed explanation about the measure theory behind why it is not spooky to find patterns in numbers. It is widely believed (although not proven) that Π [sic] is normal. Ah yes, that was my immediate reaction too; but also as a short debunking of his methods. In fact, I seem to remember it is thought to apply to all irrational numbers, so also the square root of 2, right? Try as much as you want – you can never find anything in this universe which reifies Π [sic]. There’s no perfect circle that you can measure to find a perfect value of Π [sic]. Eh? What is that supposed to mean? π can be measured, ideally to any degree of precision, by any numbers of empirical means. It is harder than trying to approximate it by pure algorithmic methods though. It isn’t dependent on Euclidean geometry either, it is inherent in radiation, radioactive decay, probabilistic distributions, et cetera – but the fact that our space is globally flat inflates the number of useful methods. I believe that a god that can encode messaged in pi or any other mathematical constant such as e or whatever to be a much more powerful being than one who can encode messages in more physical constants e.g. the fine structure constant. Congrats, the fact that it is impossible must mean that you have found a powerful (sic!) theological ‘proof’ against supposedly almighty abrahamic gods. I don’t understand why god should put fibonacci numbers, square roots or primes into π. What shall it mean? Even if it were surprising to find small numbers, like the beginning of the fibonacci sequence in ciphers of another number – it doesn’t mean anything. There is no rule, claimed before visiting the ciphers, what you need to find where. 1,2,3 and 3,4,5 are found in ciphers from 0-9: surprise! I would have expected to find kittens or a lost sock. Can anybody tell what a well-known-pattern missing means? If Pi would start with the even numbers 0,2,4,6,8 after the decimal point (3,02468) – what would that have meant? Obviously that must have meant something! 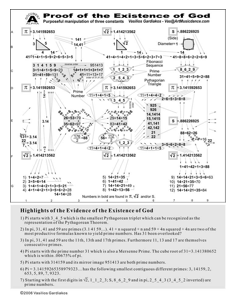 It’s the same pattern as proving god from PI, or aliens from the pyramides. In fact, I seem to remember it is thought to apply to all irrational numbers, so also the square root of 2, right? It is definitely false that all irrationals are normal (short proof: there are uncountably many numbers with only 1 and 0 in the decimal expansion). It’s conjectured that all algebraic irrationals (like root 2) are normal (in every base). Seems to me that the claim that pi is a “fixed” number which arises from the axiomatic ratio of a circle to its diameter is only true in so-called “flat” space. But this strikes me as somewhat tautological. To some extent our perception of the flatness of space is relativistic. Since our measuring tools and ourselves are all subject to the same geometry of space time, is there such a thing as absolute “flatness” – or would the inhabitants of any universe perceive the curvature of their space-time to also be zero? Even in our “flat” universe, would pi remain constant in the curved space-time field near massive cosmological objectives such as stars, quasars or black holes? An added thought… Perhaps more intriguing — could we not use a nearly infinitely precise physical measurement of pi an compare that number to its standard polynomial series derivation as a means to detect local curvature of space-time that is not apparent to us by other means? Okay – I’ll stop now. The method you describe will in some cases indicate that you are standing on a curved surface, but sometimes not. Imagine you are standing on the north pole of the earth. The equator is now a set of points equidistant from you. You could consider this a circle with a radius 1/4th of the Earths circumference. Thus the ratio of cirumference to diameter of this circle is 2, not 3.14, and we know the surface of the Earth is curved. Now imagine yourself standing on a cylinder. Pound a stake in the ground, attach a rope to it, and walk in a circle by keeping the rope tight. Compare the distance you’ve walked to twice the length of the rope and you will always come out with a ratio of 3.14. This is because you can consider a cylinder essentially as a flat surface on which two edges have been glued together. You can ‘uncurve’ it without stretching to get a flat surface again. What you are measuring with your experiments is what is called the Gaussian curvature, and not the full Riemannian curvature which is used in GR.